Awakening Of the Inner Self! Thanks to life and people I meet who contribute everyday to my writing by being my inspiration! Plagiarism is not appreciated! But I certainly do appreciate your comments. So please do share your thoughts always! Say cheers to peace and Enjoy life! It was yet another Friday or billions of earthlings. May be it was a mundane day ahead for some and exciting for others. An exciting day ahead for the ones who were certain of the joy to be unwrapped the next day, the weekend. Well, in my case it was the former. Blame it on being one amongst the many who work on Saturdays. At the end of day, I hurriedly shut down my laptop and shoved it into my backpack. There was a sense of eagerness brewing within. The eagerness had a name Agam. 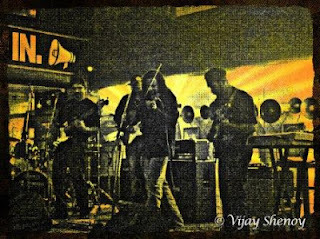 This contemporary carnatic rock band from Bangalore had caught my fascination sometime back. I had heard a few of my colleagues talking about the band in office. They where raving about the fact how well the band played at a music festival called Storm Festival at Coorg last year. It was my curiosity to know more about these guys that led me to a video of the band on YouTube. The song called ‘Malhar Jam' was what I found on top of my Google search result. It was a video of Agam playing on a popular music show called Coke Studio on MTV. And here I was almost half a year later walking hurriedly to a lesser known place to me called Bak Bak Bar to watch them perform live. When I walked in and was trying to find a place as close to the performing area I spotted Harish Sivaramakrishnan, the vocalist of Agam. For a moment I felt I knew this guy for ages, like a long lost friend. May be it was his radiance or my sheer innocence which gave me such a feeling. And then after short yet long wait the band came on to the stage. Harish the vocalist with his violin, Ganesh on Drums, Swamy on Keyboards, Vignesh with bass guitar, Praveen the lead guitarist and Jagadish with rhythm Guitar everyone was on stage. The stage seemed to be tad too small small to accommodate the big stars. What happened in the next two hours will surely go down in my memory as the most amazing two hours of live music in my life. Well these words are not sugar coated to appease anyone. These moments will forever be memorable for the fact that it was my first ever experience watching a live musical act. The band played few of my favourite songs from their album The Inner Self Awakens, which included Brahma's Dance, Rudra, Malhar Jam, The Boat Song, Swans of Saraswati and Dhanashree Thillana . Each of the songs had a mystical touch, traversing the listeners to world of imagination and tranquillity despite the madness. At the end of their performance I looked around and I knew, the crowd had completely soaked itself in the musical trance and was yet hungry for more. Alas it was not a random jamming in the free world and so the band had to bring the curtains down. But as they did so, they knew they had ended on good note, as the crowd around stood up to applaud their magical talent. Well I did shake a hand or two with the band members and was excited to do so. To me it was one of the most thrilling evenings, it simply couldn’t have been better. And I knew from within, the music of this band and more importantly perseverance they displayed in their journey to become the band Agam, that they are today, was the inspiration I needed to pick up the pen lying idle on my desk and to start writing again. True to the name of their album and the meaning hidden in the band’s name the Inner Self in me has truly awakened! - VJ Says ~ Cheers and Peace! Seems you had a nice time and see I have already hit the search button for Agam.....they have a blog too. Meenakshi Glad I could influence you with my kinda music... Cheers! wow, what a 'musical' memoir! gr8! It's an remarkable piece of writing designed for all the internet viewers; they will get advantage from it I am sure. achievement you get entry to persistently fast. natryskowe jak i kuchenne z mnogą ilością udoskonaleń. Główną zaletą serii jest niesamowita oszczędność wody. Z pewnością można powiedzieć, że bateria oszczędza wodę za nas. Nie jest potrzebne pamiętać o tym by ograniczać strumień – to już zadanie naszej baterii. Ponad to funkcją jest również ograniczenie temperatury. With more than a dash of emotion. To unravel the unknown in each other. Like a flowing river, they exchanged thoughts unabashed. A beginning of a shadowed tale of mystic longing." Yet hope says they would someday be entwined. It's a battle less spoken, but I know many shall be fought. Sometimes misunderstood, unacceptable for few. These emotions maybe shunned by many as no art. Wish to die accepted, but denied and stay detest. Your soul deserves a sweet song, let it be one about it's zest. An arm chair philosopher, Relentless rambler, Gabby, Buddha of my own world.